Well, it looks like that little post was enough to draw the attention of our friend Scott N. who contacted me last week to say that not only does he have a G.M. 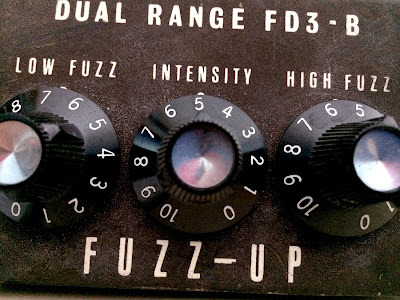 Fuzz Up, but he has a version I had never seen or heard of before; the FD3-B! He was kind enough to send a few photos (sorry guys, no gut shots), and even took the time to record a nice youtube demo. Scott seems to recall purchasing the pedal around 1967 in Detroit, MI. Which, not surprisingly, is where G.M. originates. The paint on the enclosure has an almost fuzzy texture to it, which would predate the fOXX Tone Machine by a few years... If you look at the photo of the inside, you can see that they just painted over the enclosure of the FD3-A's, as it has that same burgundy red finish. Scott also pointed out that the knobs were different on both pedals. Ok, a HUGE thank you! goes out to our friend Scott N. for helping us crack the mystery of the G.M. Fuzz Up, and also for taking the time to record this demo.